You all remember that iconic crane-kick at the end of the Karate Kid, right? Well, it took a while, but the guys over at Boston Dynamics have finally been able to recreate that iconic moment in all its glory. The robot could probably take Ralph Macchio and Mister Miyagi in a fight and win. Ok, fine. While this robot doesn’t actually jump and do the kick, it’s quite impressive how the robot can maintain its balance on one leg as it extends its arms up and down into the crane pose. 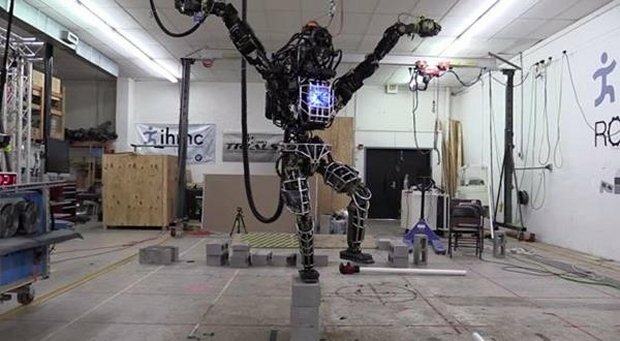 And now that they’ve mastered the Karate Kid, I expect Boston Dynamics to be looking into recreating Real Steel in real life. This entry was posted in Images, Videos and tagged COOL, Fun, Karate Kid, Robot. Bookmark the permalink. Post a comment or leave a trackback: Trackback URL.